William Shakespeare - born April 1564; baptised April 26, 1564; died April 23, 1616 (O.S. ), May 3, 1616 (N.S. )—has a reputation as the greatest writer the English language has ever known. Indeed, the English Renaissance has often been called "the age of Shakespeare". As a playwright, he performed the rare feat of excelling in both tragedy and comedy. He also wrote 154 sonnets, two narrative poems, and a handful of shorter poems; several of his plays feature songs that are among the finest lyric poems in English. These arguably feature amongst the most brilliant pieces of English literature ever written, because of Shakespeare's ability to rise beyond the narrative and describe the innermost and the most profound aspects of human nature. Shakespeare wrote his works between 1588 and 1613, although the exact dates and chronology of the plays attributed to him remain relatively uncertain in many instances. Shakespeare's influence on the English-speaking world shows in the ready recognition afforded many quotations from Shakespearean plays, the titles of works based on Shakespearean phrases, and the many adaptations of his plays. Other indicators of contemporary influence include his appearance in the top ten of the "100 Greatest Britons" poll sponsored by the BBC, the frequent productions based on his work, such as the BBC Television Shakespeare, and the success of the fictional account of his life in the 1998 film Shakespeare in Love. Most historians agree that William Shakespeare - actor, playwright and poet - was a single person, one for whom we have considerable historical records. (Note that Elizabethan English did not use standardised spelling; although his surname most commonly appears as Shakespeare, Shakespere also recurs frequently, and the name sometimes appears as Shakespear, Shaksper and even Shaxberd. Shakespeare was born in Stratford-upon-Avon, England, in April 1564, the son of John Shakespeare, a glove-maker, and of Mary Arden. His baptismal record dates to April 26 of that year and (given traditional timings of baptisms) tradition considers April 23 as his birthday. Shakespeare's father, prosperous at the time of William's birth, was prosecuted for participating in the black market in wool, and later lost his position as an alderman. Some evidence exists that both sides of the family had Roman Catholic sympathies. As the son of a prominent town official, William Shakespeare most likely attended the Stratford grammar school, which provided an intensive education in Latin grammar and literature. There is no evidence that his formal education extended beyond this. On May 26, 1583 Shakespeare's first child, Susanna, was baptised at Stratford. There soon followed on February 2, 1585 the baptisms of a son, Hamnet, and of a daughter, Judith. In 1596 Hamnet died; he was buried on August 11, 1596. Because of the similarities of their names, some suspect that his death provided the impetus for Shakespeare's The Tragical History of Hamlet, Prince of Denmark. By 1598 Shakespeare had moved to the parish of St. Helen's, Bishopsgate, and appeared top of a list of actors in Every man in his Humour written by Ben Jonson. Shakespeare became an actor, writer and ultimately part-owner of an acting company known as The Lord Chamberlain's Men — the company took its name, like others of the period, from its aristocratic sponsor, the Lord Chamberlain. The group became sufficiently popular that after the death of Elizabeth I and the coronation of James I (1603), the new monarch adopted the company and it became known as The King's Men. Various documents recording legal affairs and commercial transactions show that Shakespeare grew increasingly affluent in his London years. He did well enough to buy a property in Blackfriars, London, and owned the second-largest house in Stratford, New Place. In 1609 he published his sonnets, love poems variously addressed: some to a 'dark lady', and some to a young man (or 'fair lord'). Shakespeare retired in approximately 1611 and died in 1616, on April 23 — perhaps part of the reason behind the tradition of his birthday being this same day. He remained married to Anne until his death. His two daughters, Susannah and Judith, survived him. Susannah married Dr John Hall, and later became the subject of a court case. His tombstone reads, "Blest be the man who cast these stones, and cursed be he that moves my bones." Popular myth claims that unpublished works by Shakespeare may lie within the bard's tomb, but no-one has ever verified these claims, perhaps for fear of the curse included in the quoted epitaph. During his lifetime and shortly after his death, Shakespeare was well-regarded, but not considered the supreme poet of his age. He was included in some contemporary lists of leading poets, but he lacked the stature of Edmund Spenser or Philip Sidney. It is more difficult to assess his contemporary reputation as a playwright: plays were considered ephemeral and even somewhat disreputable entertainments rather than serious literature. The fact that his plays were collected in an expensively produced folio in 1623 (the only precedent being Ben Jonson's Workes of 1616) and the fact that that folio went into another edition within nine years, indicate that he was held in unusually high regard for a playwright. After the Interregnum stage ban of 1642—1660, the new Restoration theatre companies had the previous generation of playwrights as the mainstay of their repertory, most of all the phenomenally popular Beaumont and Fletcher team, but also Ben Jonson and Shakespeare. Old plays were often adapted for the Restoration stage, and where Shakespeare is concerned, this undertaking has seemed shockingly respectless to posterity. A notorious example is Nahum Tate's happy-ending King Lear of 1681, which held the stage until 1838. In the early 18th century, Shakespeare took over the lead on the English stage from Beaumont and Fletcher, never to relinquish it again. In literary criticism, by contrast, Shakespeare held a unique position from the start. The unbending French neo-classical "rules" and the three unities of time, place, and action never really caught on in England, and and practically all critics gave the more "correct" Ben Jonson second place to "the incomparable Shakespeare" (John Dryden, 1668), the follower of nature, the untaught genius, the great realist of human character. The long-lived myth that the Romantics were the first generation to truly appreciate Shakespeare and to prefer him to Ben Jonson is contradicted by accolades from Restoration and 18th-century writers such as John Dryden, Joseph Addison, Alexander Pope, and Samuel Johnson. The 18th century is also largely responsible for setting the text of Shakespeare's plays. Nicholas Rowe created the first truly scholarly text for the plays in 1709, and Edmund Malone's Variorum Edition (published posthumously in 1821] is still the basis of modern editions of the plays. As noted above, there is considerable historical evidence of the existence of a William Shakespeare who lived in both Stratford-upon-Avon and London. 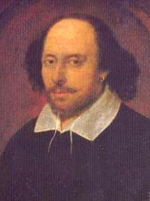 The vast majority of academics identify this Shakespeare as the Shakespeare, contrary to the theories of some who believe that there were two different Shakespeares, one an actor, the other a playwright; or that some other writer used the name "Shakespeare" as a pseudonym; or that the alternative spellings of Shakespeare's surname were actually legitimate spellings of two different names. In part, this debate stems from the scarcity and ambiguity of many of the historical records of this period; even the painting that accompanies this article (and that appears above the name "William Shakespeare" in the National Portrait Gallery, London) may not depict Shakespeare at all. Various fringe scholars have suggested writers such as Sir Francis Bacon, Edward de Vere, Christopher Marlowe and even Queen Elizabeth I as alternative authors or co-authors for some or all of "Shakespeare"'s work. The proponents of such claims necessarily rely on conspiracy theories to explain the lack of direct historical evidence for them. Shakespeare's plays first appeared in print as a series of folios and quartos, and scholars, actors and directors continue to study and perform them extensively. They form an established part of the Western canon of literature. Some scholars of Shakespeare break the category of "Comedies" into "Comedies" and "Romances". Plays in the latter category would include Cymbeline, The Winter's Tale, Pericles Prince of Tyre, and The Tempest. Like most playwrights of his period, Shakespeare did not always write alone, and scholars believe a number of his plays collaborative. Some of the following attributions, such as for The Two Noble Kinsmen, have well-attested contemporary documentation; others, such as for Titus Andronicus, remain more controversial, depending on linguistic analysis by modern scholars. Cardenio, a lost play; reports suggest Shakespeare collaborated on it with John Fletcher. Timon of Athens may result from collaboration between Shakespeare and Thomas Middleton; this might explain its incoherent plot and its unusually cynical tone. The Two Noble Kinsmen, published in quarto in 1654 and attributed to John Fletcher and William Shakespeare; each appears to have written about about half of it. Love's Labour's Won A late sixteenth-century writer, Francis Meres, and a scrap of paper (apparently from a bookseller), both list this title among Shakespeare's recent works, but no play of this title has survived. It may have become lost, or it may represent an alternate title of one of the plays listed above, such as Much Ado About Nothing or All's Well That Ends Well. Cardenio, a late play by Shakespeare and Fletcher, referred to in several documents, has not survived. It re-worked a tale in Cervantes' Don Quixote. In 1727, Lewis Theobald produced a play he called Double Falshood, which he claimed to have adapted from three manuscripts of a lost play by Shakespeare that he did not name. Double Falshood does re-work the Cardenio story, and modern scholarship generally agrees that Double Falshood represents all we have of the lost play. A Funeral Elegy by W.S. (?). For a period many believed, on the basis of stylistic evidence researched by Don Foster, that Shakespeare wrote a Funeral Elegy for William Peter. However most scholars, including Foster, now conclude that this evidence was flawed and that Shakespeare did not write the Elegy, which is more likely from the pen of John Ford. Unlike his contemporary Ben Jonson, Shakespeare did not have direct involvement in publishing his plays. The problem of identifying what Shakespeare actually wrote became a major concern for most modern editions. Textual corruptions stemming from printers' errors, misreadings by compositors or simply wrongly scanned lines from the source material litter the Quartos and the First Folio. Additionally, in an age before standardised spelling, Shakespeare often wrote a word several times in a different spelling, and this may have contributed to some of the transcribers' confusion. Modern editors have the task of reconstructing Shakespeare's original words and expurgating errors as far as possible. The textual problem can, however, become rather complicated. Modern scholarship now believes Shakespeare to have modified his plays through the years, sometimes leading to two existing versions of one play. To provide a modern text in such cases, editors must face the choice between the original first version and the later, revised, usually more theatrical version. In the past editors have resolved this problem by conflating the texts to provide what they believe to be a superior Ur-text, but critics now argue that to provide a conflated text would run contrary to Shakespeare's intentions. In King Lear for example, two independent versions, each with their own textual integrity, exist in the Quarto and the Folio versions. Shakespeare's changes here extend from the merely local to the structural. Hence the Oxford Shakespeare, published in 1986, provides two different versions of the play, each with respectable authority. The problem exists with at least four other Shakespearean plays (Henry IV, part 1, Hamlet, Troilus and Cressida, and Othello ).